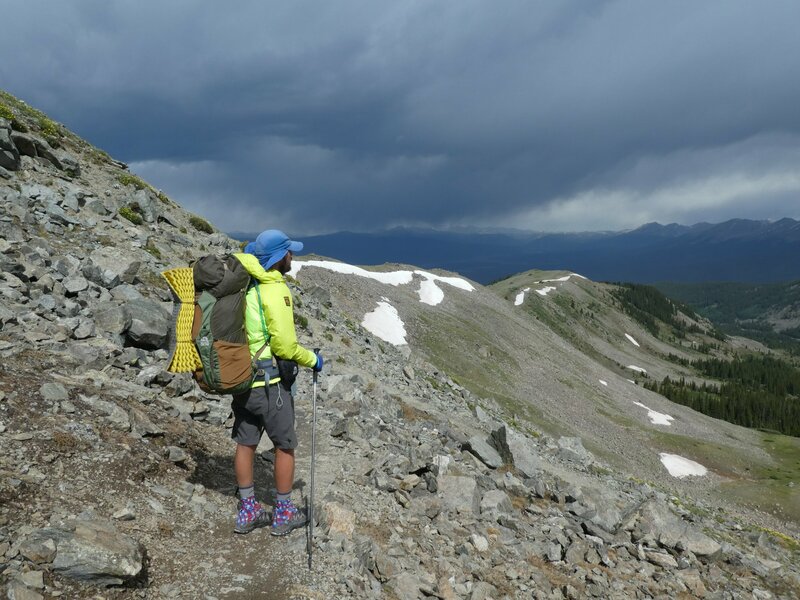 84 miles and 17, 493 feet of ascent over three and a half days – this was probably the most physically challenging section of the CDT so far, and we loved it! 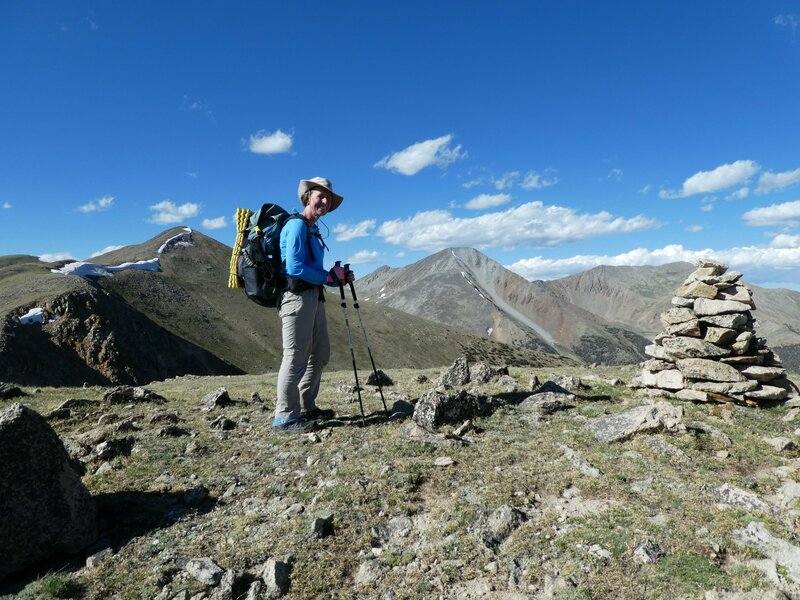 When we were planning our resupply however, we just looked at the mileage and reckoned on doing our usual 20 to 23 miles a day – totally forgetting to check the ascent. 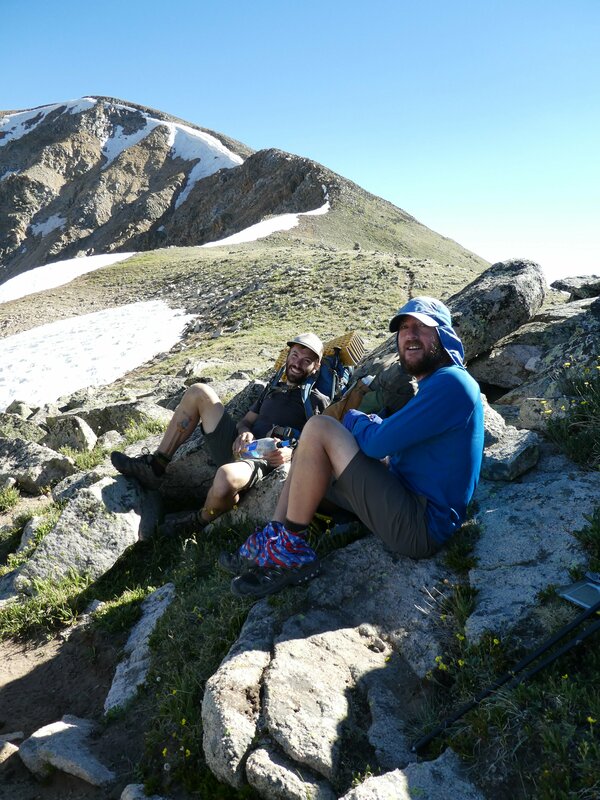 So when we got dropped off at Monarch Pass, along with eight other hikers, we only had three days of food with us. 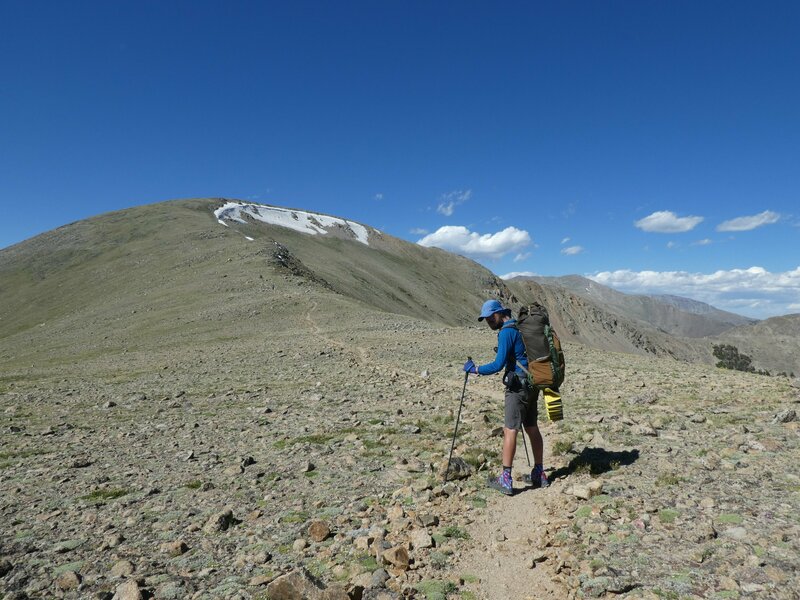 After we had climbed steeply up over Bald Mountain at 12,552 feet, before a long descent to camp at valley level at 10,443 feet, we realised this section was going to push our limits! But we did get a bit of a break the next day when we met the Alpine Railroad, a disused railroad track which was built to service the local silver mines at the end of the 19th century. We followed this for a few miles at a nice gentle gradient, reading the information boards along the way – it sounded like a particularly hazardous route for a railroad, with fallen trees, deep snow, avalanches and tight bends all requiring skill and ingenuity to overcome. 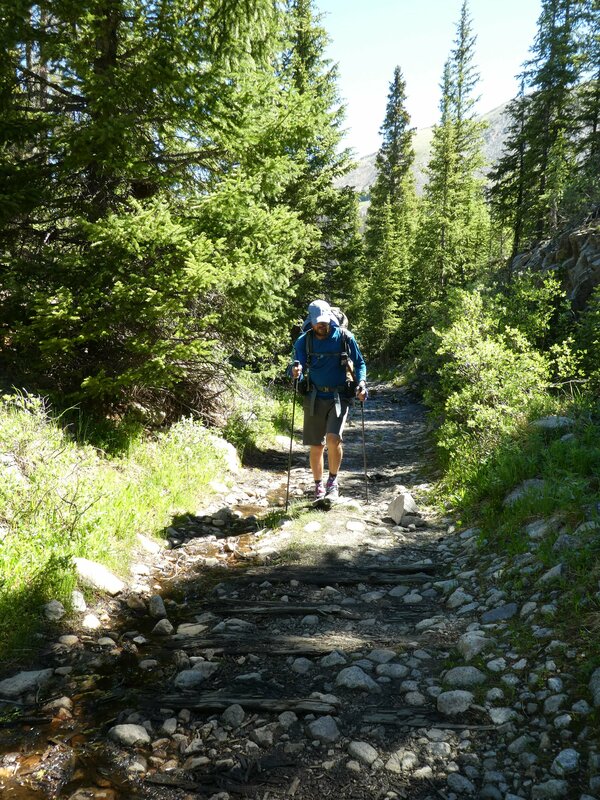 We followed the old track as far as the now-collapsed eastern portal to the Alpine Tunnel, which was the first tunnel to be constructed through the Continental Divide. Then we were off on the rollercoaster again, up and over one pass, way down to valley bottom, before a huge climb back onto the Divide. 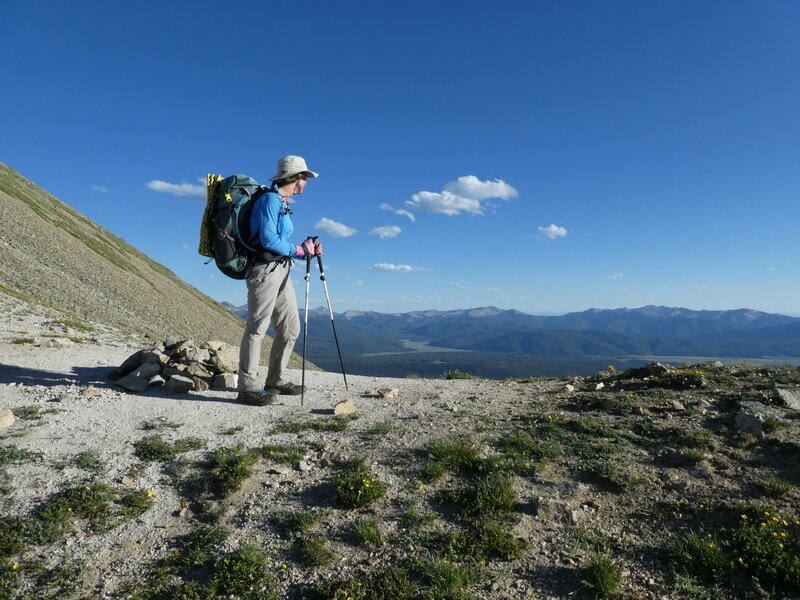 Way up above the treeline, we traversed round several corries and over ridges before finally camping on a small meadow at about 12,087 feet. 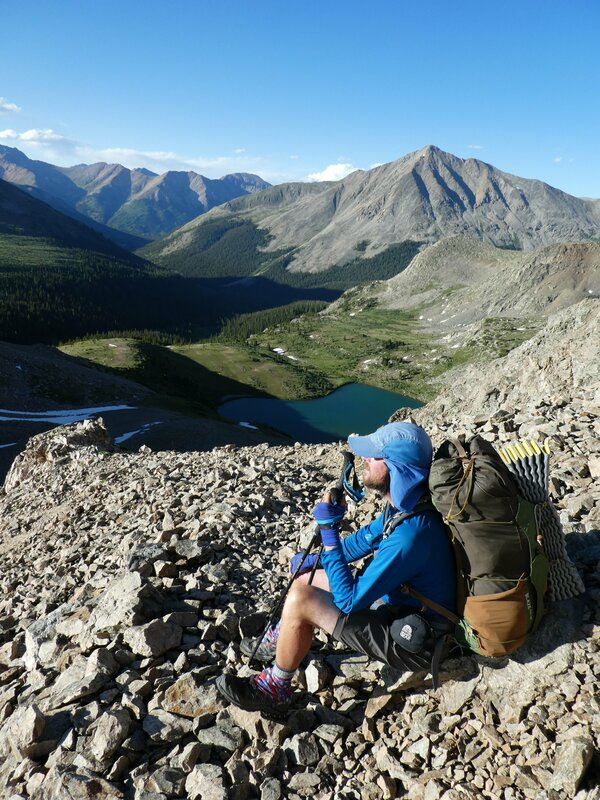 Unfortunately it was also inhabited by lots of marmots, which we were convinced were planning a raid on our food supplies! Setting off at sunrise the next morning, after an early climb over a col we enjoyed a long descent and an easy stretch along valley bottom. Passing by some water meadows, Neil spotted a big bulky animal with a smaller one following behind, almost hidden in the long grass. As we drew closer to them, we realised it was a mother moose and her calf. We were really excited, having never seen moose before! Unfortunately the “bleep” from my camera alerted the mother moose to our presence (in spite of me being some distance away) – she turned and stared at me, and I spent the next couple of miles glancing nervously over my shoulder, just in case she decided to chase off the intruders! 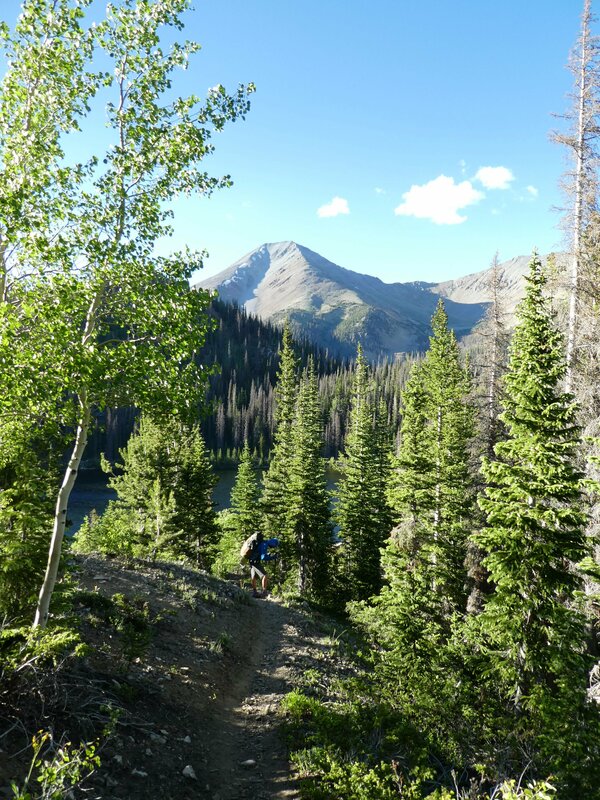 Turning sharply uphill, we had one more big ascent to do before the end of the day, over Lake Ann Pass. 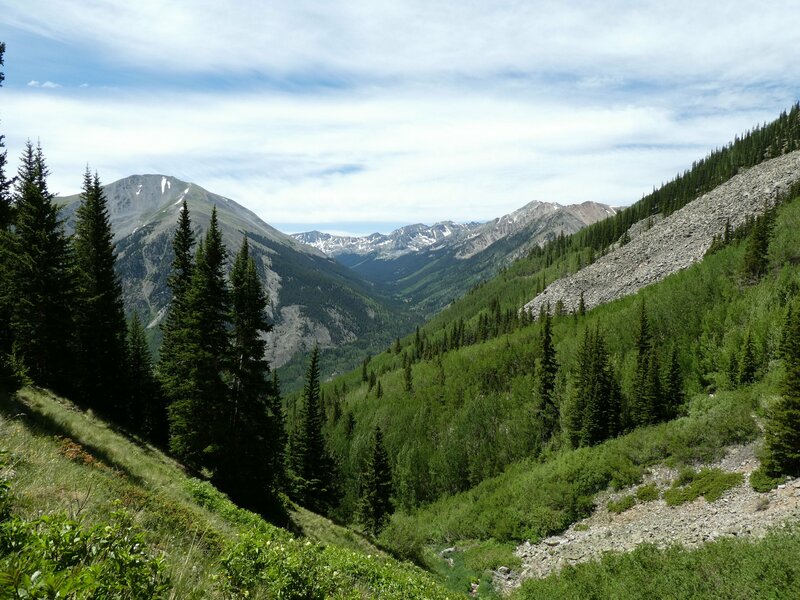 After a long slog up through aspens and pines, I thought we must be near the top, but then spotted a steep series of zigzags going up and up above the treeline to a very high pass. Plodding painfully upwards, we were hugely relieved to reach the top – then found that on the north side was an overhanging snow cornice. With no crampons, microspikes or ice axes, we carefully picked our way around the side of the overhanging section, feeling very glad that we were crossing it at the end of the day when the snow was soft! 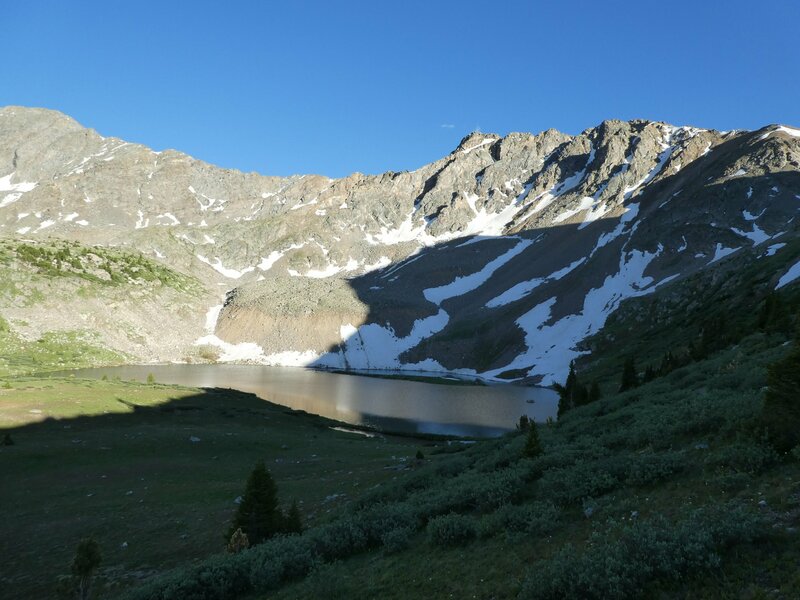 Dropping steeply down to Lake Ann, nestled in a corrie below the towering peaks of the Divide, we finally made camp at the end of a 25 mile day. Our last day on this section got off to a frosty start, but the day soon warmed up as we made our way along a valley full of day hikers and runners. 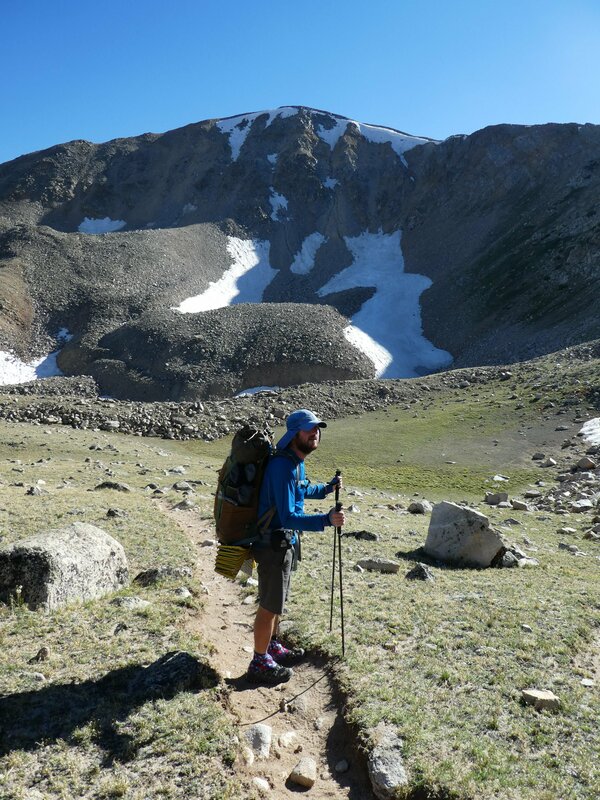 Before long a sharp turn up a side valley took us up our final ascent of this leg, the insanely steep Hope Pass. Gasping for breath on the steep gradient, we passed trail maintenance crews doing a fine job at improving the trail, and lots of runners who went flying past. Finally reaching the top of the zigzags, we got a view down to our destination, Twin Lakes. 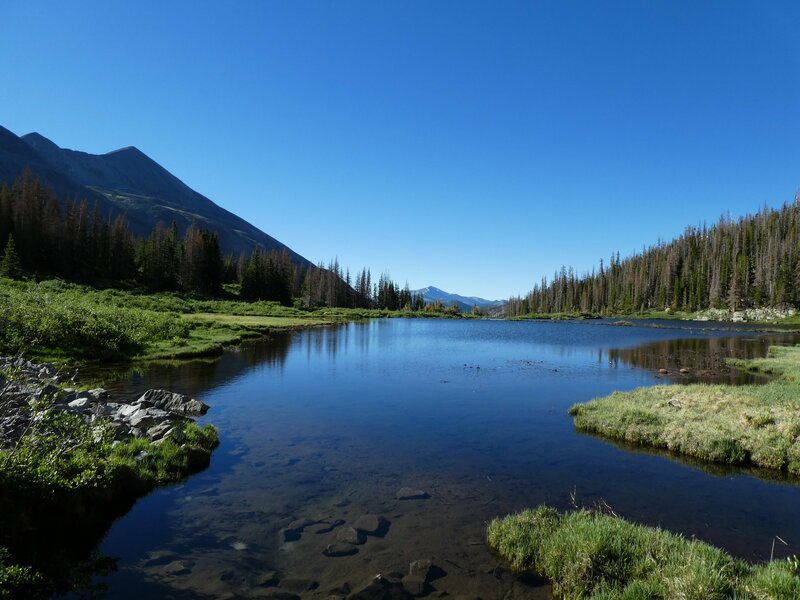 After a long descent and a rather aqueous shortcut around the end of the lake, we arrived in the small town of Twin Lakes. Being a sunny summer Saturday the two motels were both full, but Randy the trail angel offered us camping space near his RV, parked up above a Forestry Service campsite above town. 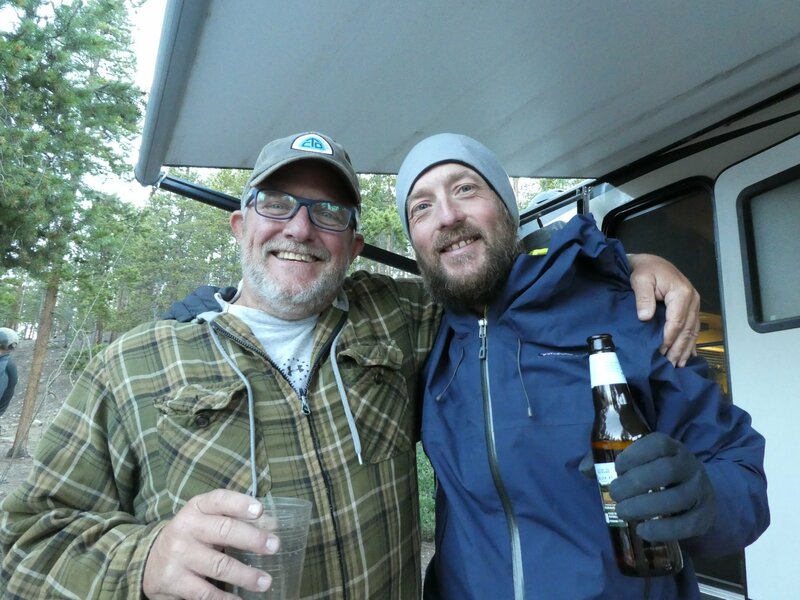 There he let us use the shower in his RV, and fed us (me, Neil, Brightside, Yoda and Turtle) a fine meal of salad and hot dogs. Sitting round drinking beer, listening to music and chatting, it was great to finally relax after another hard push! Wound up doing that same section to complete the Collegiate Loop. 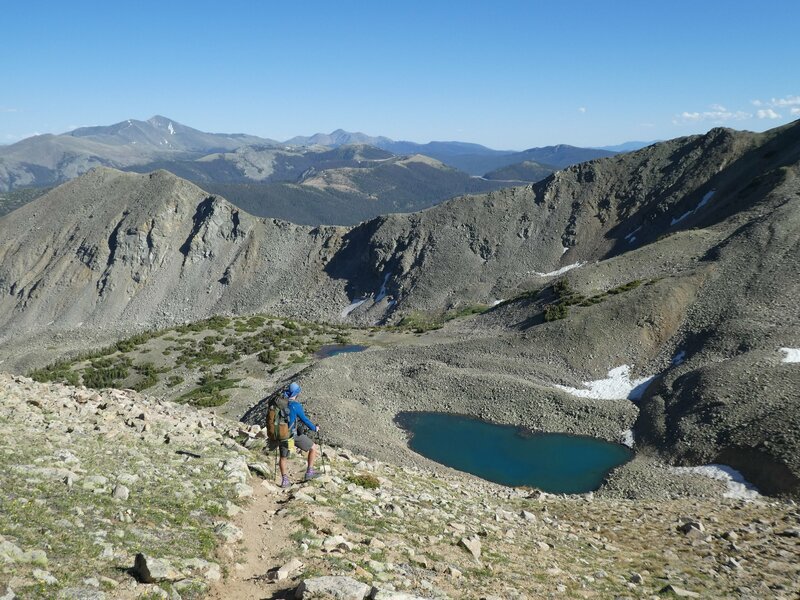 It was fabulous being above treeline so much and getting out of the heat – but there were some climbs for sure. 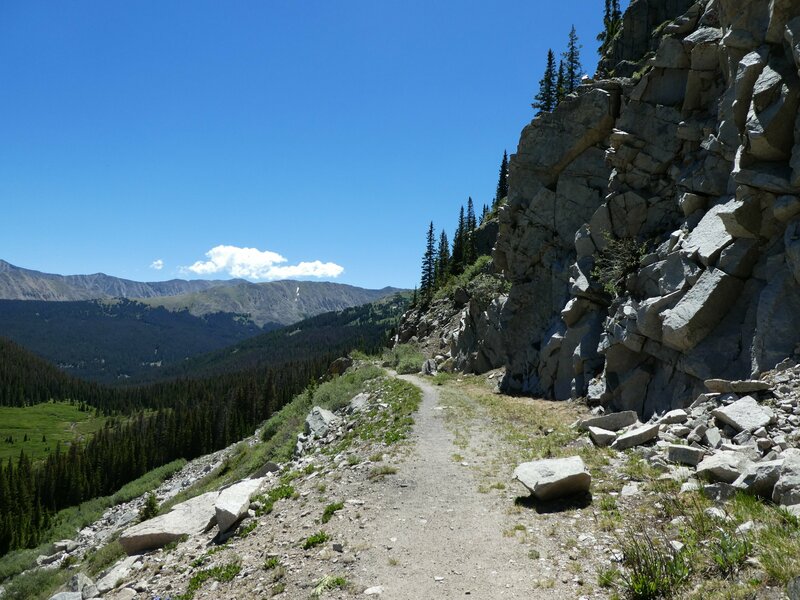 Hope Pass – I was hoping I wasn’t going to have a heart attack! Lovely to see the pics – and remember. Randy, too. Great people out there. Happy Trails! Neil’s beard is coming along well! 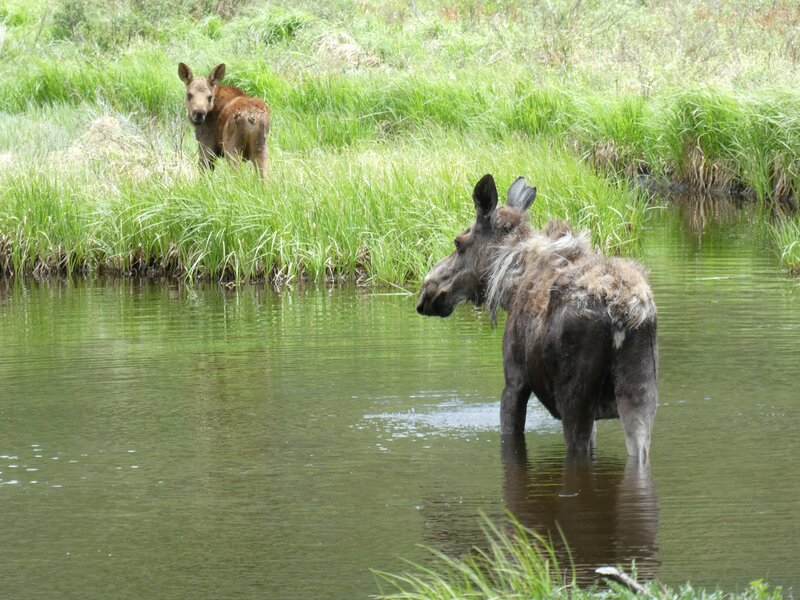 Thanks for the gorgeous photos – especially like the one of the moose mother and calf. 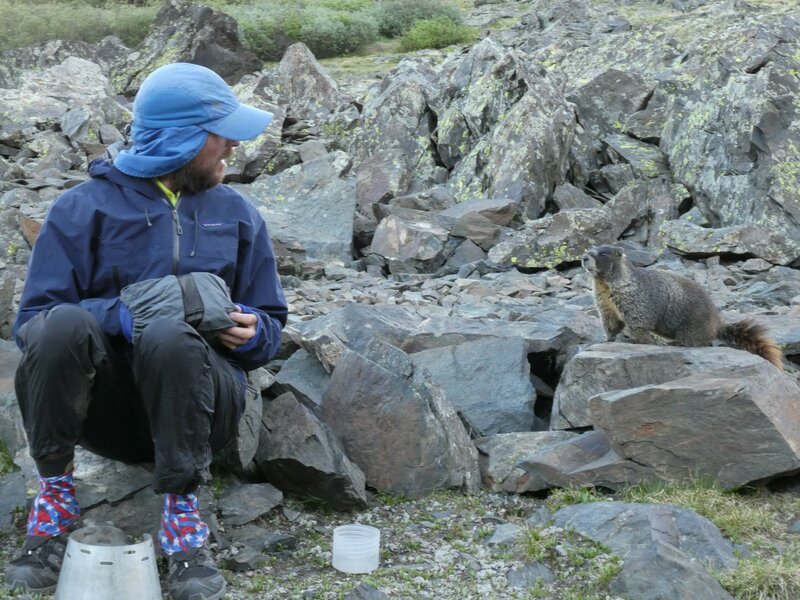 Feel like we need a caption competition for the one of Neil and the marmot. That railway track looked really rough going for walkers. So many passes – wonderful views. lucky with tent space at the RV park. I stayed in a hostel which was elevated up above the lake, taken from the Yogie guide. Stunning images. I’m happy to see you all are able to make progress. Keep enjoying yourselves.